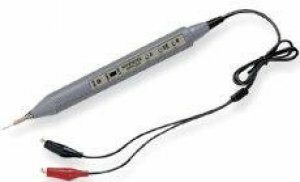 The GPG-2A logic pulser can be used to perform in-circuit testing of TTL, CMOS, and many other logic devices at a maximum of 50MHz. A Short 10 sec pulse width assures that no damage will occur to circuits while testing. With a weight less than 50g, a non-slip grip and, an external sync input, GPG-2A provides comfort and reliability for various troubleshooting tasks.